My hands flew up to cover my face. No no nooooo ... thinkthinkthinkthink, I commanded. This is grief. Yes. Grief makes people see things that aren't there. Dr. Marigold had warned me about that. A fairy under my bed. A cousin with wings. Grief. I wasn't losing it. I just missed Don, that's all. I turned to face Margaret, whose lips were moving like she was speaking in slow motion, but there was no sound coming out of her mouth, or if there was I couldn't hear it because the thunder in my head boomed so loudly. My last thought before the black veil fell and took me with it was my head was going to crack open. I felt like my head was stuffed with cotton. Maybe Peta drugged me, put something in my tea. Of course she didn't have wings. She was the same old hippie Peta, wearing the same long skirts and floral peasant blouses she wore forty years ago. "Same way I know you have a Fayette in the house." She stood and began to rifle through my dresser. "Why do you think I'm here after all these years?" She finished with my drawers and threw open the closet door. I pushed myself up and leaned against the headboard. "Get out of my closet, Peta." My throat was so dry it felt like I had swallowed sand. "You're talking nonsense. I have no idea what a Fayette is." Peta came out of the closet empty handed and approached my bed. I could smell lilacs. Granny, I thought. She smells like Granny. She leaned close to my face and whispered, "You saw them, cousin. I know you did. But don't worry. No one else could see them. You and I are the only living Fayes in the family ... so far." She dropped to her knees and looked under the bed. "Ah. There you are!" 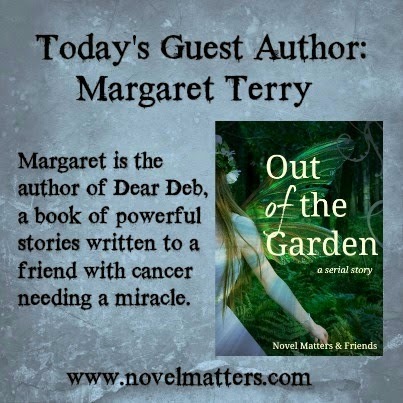 Margaret Terry is the author of Dear Deb, a non-fiction compilation of letters from Margaret to her friend, Deb, who was dying of cancer. Watch the book trailer here. I am howling LOLing. This is so perfect. But, when I went back to read the previous posts, I had to search specially for #9 - it was not yet tacked on. thanks for mentioning that, Cherry - I have notified the person who can fix that! Cherry, I believe all the parts are now posted. Don't know what happened, but I think it's corrected. Wow! That's action! I'm exhausted tracking Peta around the room and from the side splitting plot twists so brilliantly handled. Also the loving details about Granny and fainting. Well done! Oh this was just fabulous! Such a great way to transition from seeing the wings in the last part.